We are pleased to have in our clinic, two digital x-ray (radiograph) systems. One system is for dental x-rays to assess the teeth and structure of the mouth. The other system is for x-rays of the rest of the body, including the chest, abdomen and legs. All dental x-rays are performed while your pet is under general anesthesia as part of their comprehensive dental and oral examination. X-rays on the other parts of the body sometimes require sedation or general anesthesia. However, the majority of the time, our patients are cooperative enough to have x-rays obtained while they are awake (without the need for sedation or general anesthesia). 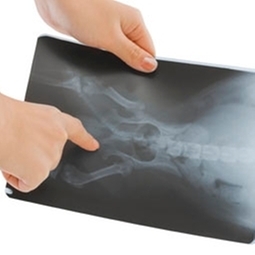 Digital x-rays can be produced quickly, and give better quality of image to assess your pet. Since the x-ray images are digital, we can copy the images to a disc for you to keep or we can transfer the images electronically to a veterinary radiologist specialist to get their expert opinion, usually within a couple of hours.